Greubel Forsey will offer its GMT, the travel watch with an inclined tourbillon for the private jet set, in black ADLC coated titanium. Last year Greubel Forsey took the covers off its first ever titanium watch, the Double Tourbillon Technique Black, which kept of all the brand’s signature aesthetic and technical features but in a more subdued style. 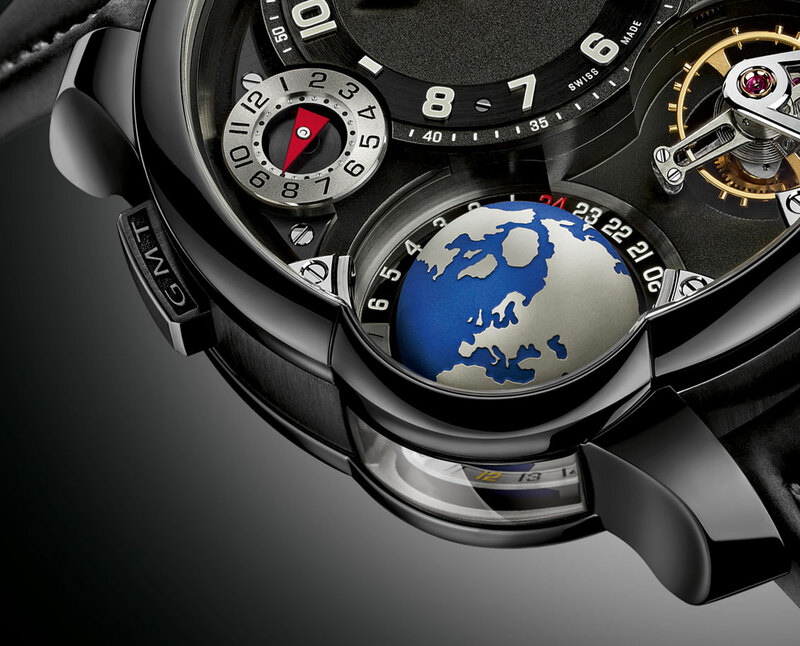 The same treatment has been applied to the GMT Black, a wristwatch that has a dual time zone function and the brand’s patented 24 second tourbillon. Making its debut at SIHH 2015, the Greubel Forsey GMT Black is fundamentally identical to the precious metal versions of the GMT, except for the case. Made of lightweight titanium and coated with a glossy black amorphous diamond-like carbon (ADLC) layer, the case has the same chunky dimensions as before, at 43.5 mm wide and 16.14 mm high. The movement has been finished with a black coat in on the bridges to match the case, making the blued steel screws and gilded components even more prominent. Functionally the GMT Black works the same as its siblings: the globe indicates day or night for the second time zone sub-dia at 11 o’clock, which can be advanced in one hour steps by the button just beside it on the case band. The cities disc on the rear is synchronised with the globe on the front, indicating the time in all 24 time zones around the world. And the tourbillon is inclined at 25 degrees, rotating at a high speed of one revolution every 24 seconds (conventional tourbillons make one round every minute). 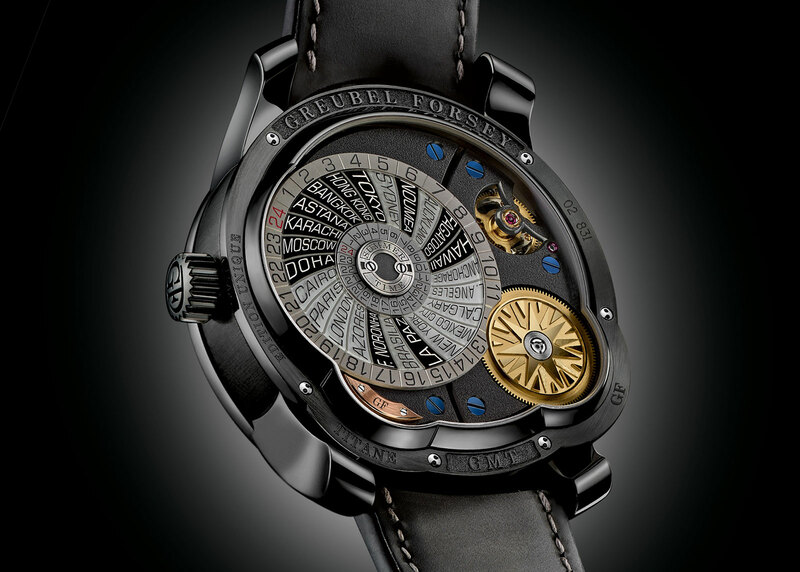 According to Greubel Forsey this compensates for the effects of gravity more effectively than a standard tourbillon. 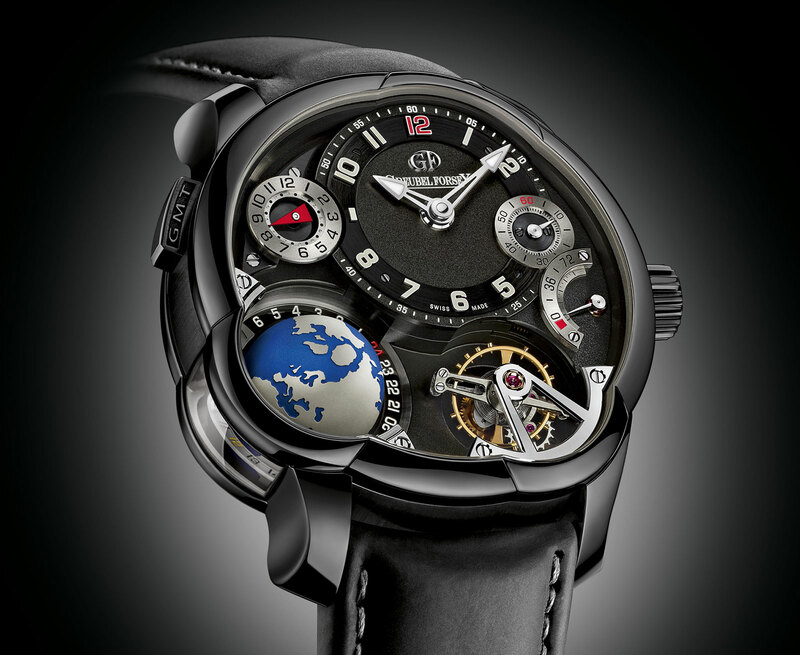 The Greubel Forsey GMT Black will sell for US$565,000 before taxes and is limited to just 22 pieces.